Camelia McNeil Elliott designs breath-taking quilts of Virginia’s historic sites, marries them with photographs, blesses them with homespun stories and creative living history of Virginia and the people who call it home. Every summer, Camelia McNeil Elliott, spent a month with her beloved grandparents in the beautiful Blue Ridge Mountains. While visiting Mabry Mill’s rotating waterwheel, Elliott imagined Lizzie Mabry grinding white corn for customers in 1908. Inspired, she wrote stories about Appalachian mountaineers and her family, such as her great-great grandmother’s incarceration in a corn crib by Civil War soldiers, her grandparent’s 1917 elopement in a horse drawn carriage during a treacherous mountain ice storm, and her father’s jail house shenanigans at the Floyd County Courthouse. Elliott’s book tells captivating and intriguing stories of Virginia history, culture, traditions, and everyday living common to all mountain families. 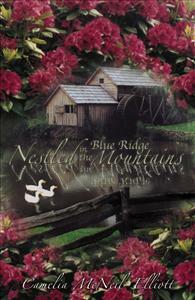 A lovely, simple book about the simplicity and beauty of living in the Blue Ridge Mountains in the early 19th century. I am not a reading enthusiast but this book was lots of fun to read. It had many good quality pictures and very interesting facts. Having grown up in the area that the author writes most about in this book, very vivid memories were brought to mind as I read the book. This type of writing is needed to maintain a living history of those who were born, lived, raised their families, and died in the beautiful Blue Ridge Mountains of Virginia during the last two centuries. ‘ Nestled in the Blue Ridge Mountains’ opened a window to a world not apparent to a newcomer to this area of Virginia. I loved the stories in this book and Camelia’s whimsical, interpretive quilts and photographs added a whole new dimension to the tales . Thank you for a great addition to my library of local lore about this part of Virginia we call home. The book brought back many fond memories of my summer visits at my Grandparents home (Benton and Florence McNeil). It records for future generations the simple but bountiful life of the McNeil families. Thank you Camelia for your work on this book. Having traveled to Virginia with Camelia in 2003, I saw the ideas popping into her head for this book. We took many pictures together, traveled to several of the places together and scrapbooked our memories together. To see the fruition of Camelia's dreams come to pass is a joy. This is a wonderful, comfortable read of times gone by. Oh that were so simple today.